This post contains affiliate links. If you click on a link and purchase anything, I may receive a commission at no additional charge to you. Thank you for helping the hive to thrive! It’s too bad this isn’t our home. Don’t get me wrong. I’m not knocking those who have this life. It just isn’t how things go around here on the regular. Mostly, the kitchen is a drop zone for dirty dishes. I spend a large portion of my day in there. The cooking part is enjoyable. The dirty dished part, no so much. Oh, but I do look forward to the day when my kids can provide an edible meal for the entire family. We have a long way to go. 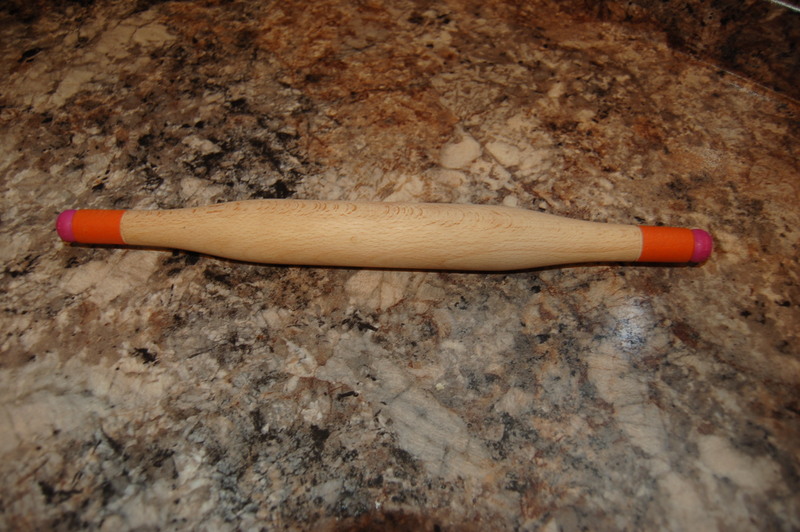 We have to begin somewhere, so when I came across this adorable chapati rolling pin while shopping at World Market, I was inspired to get Baby Honeybee in the kitchen and develop a Cooking with Kids series here at the hive. The older kids may see right through my efforts to teach them to feed themselves, but Baby Honeybee is still young enough to get excited about cooking with me. There’s hope for the future. So, here’s the funny thing. We live in Texas and often make tortillas at home. I have tried many times to get Baby Honeybee to make them with me and she has shown zero interest. She claims to not like them. 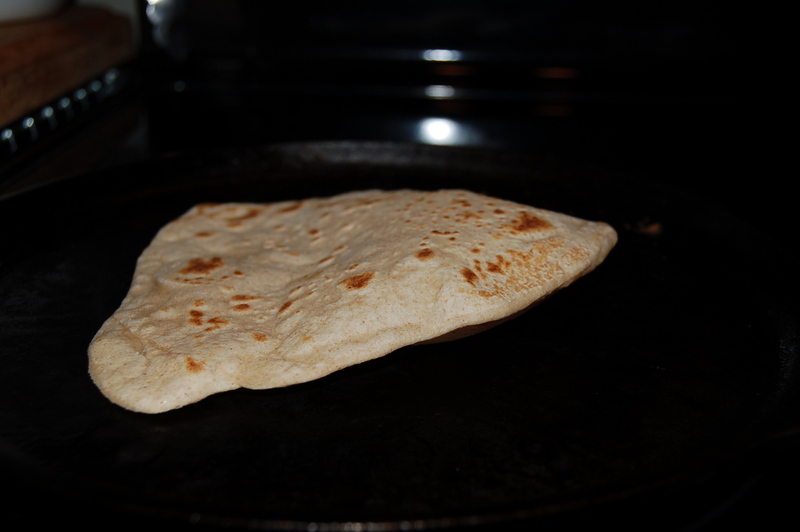 A tortilla is made of flour, water and shortening (or lard, if you’re a traditionalist). 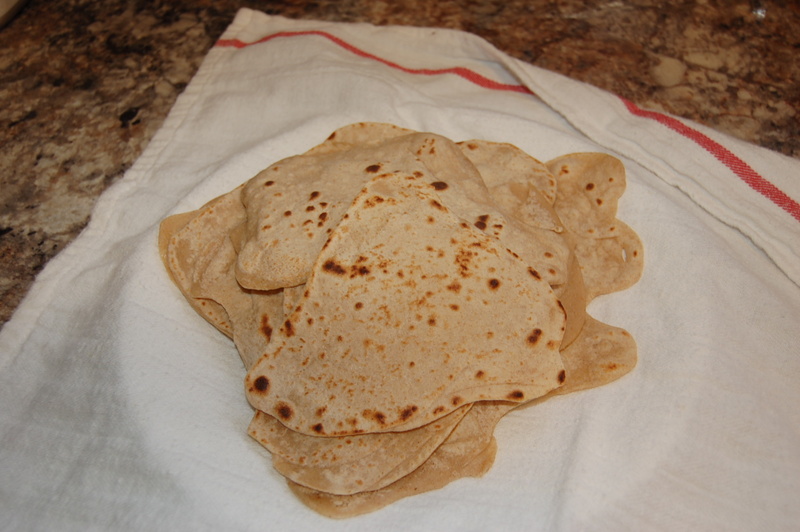 Chapati (Also spelled chapatti, just to be confusing) are made of flour, water and olive oil, or ghee. Both are cooked on a stove top cast iron griddle and both are flat breads. So, they are totally different and that explains why the picky 5 year-old hates tortillas and loves chapatis (or chapattis). In a large bowl, combine the flours and the salt. Use a whisk to thoroughly mix. 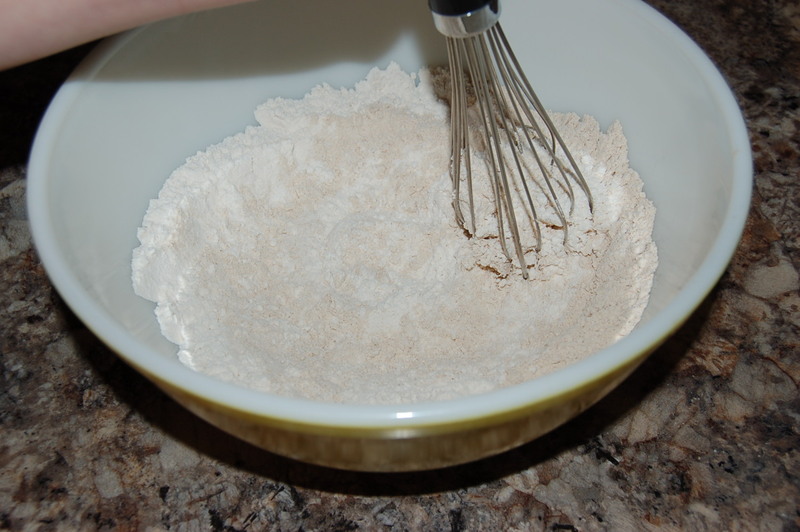 Add 3/4 of a cup of water and, using your hand, mix the water into the flour in a circular motion. 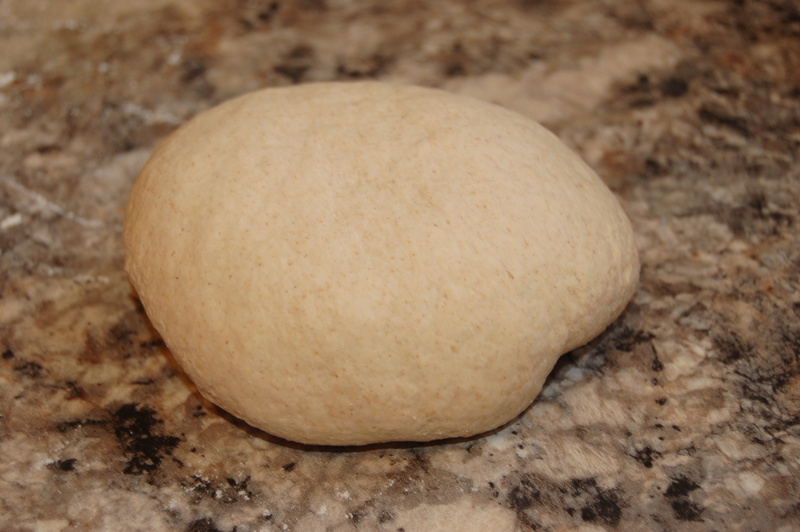 If the dough isn’t coming together into a ball, add the remaining water. 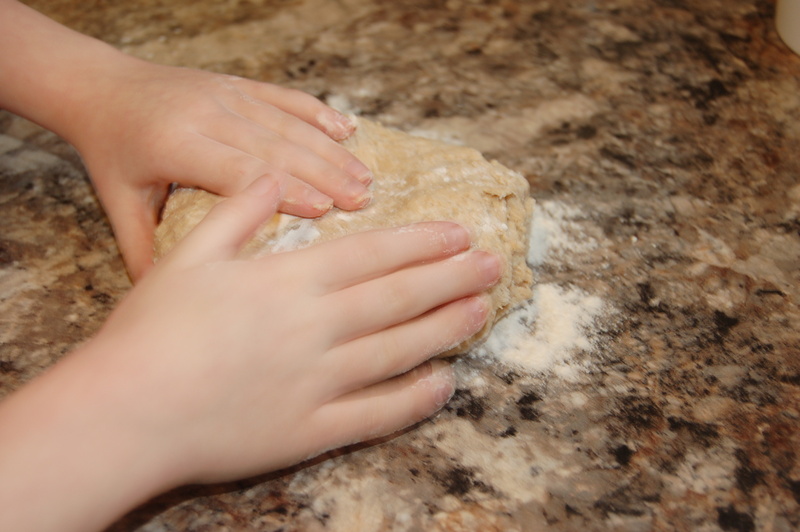 Sprinkle a small amount of flour on your work surface and knead the dough for about 5 minutes to fully activate the gluten. 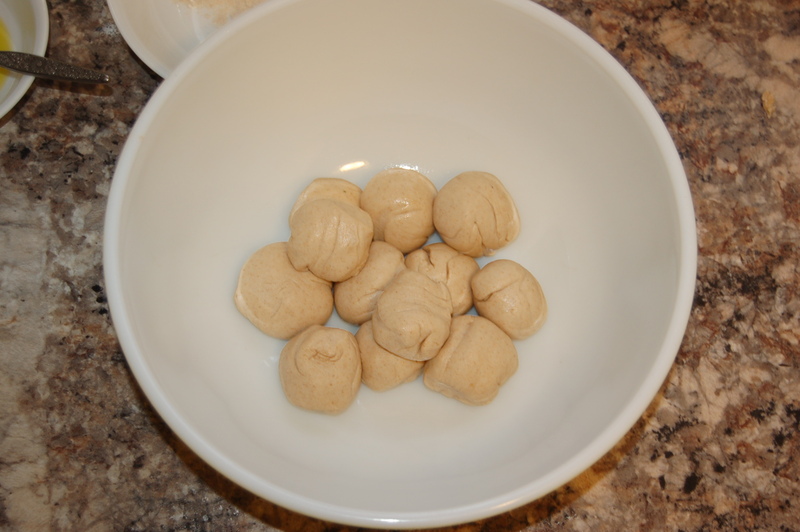 In a clean bowl, drizzle a small amount of oil and roll the dough around to coat. Cover the bowl with a damp towel or plastic wrap and let it rest for about 30 minutes. Now for the fun part! 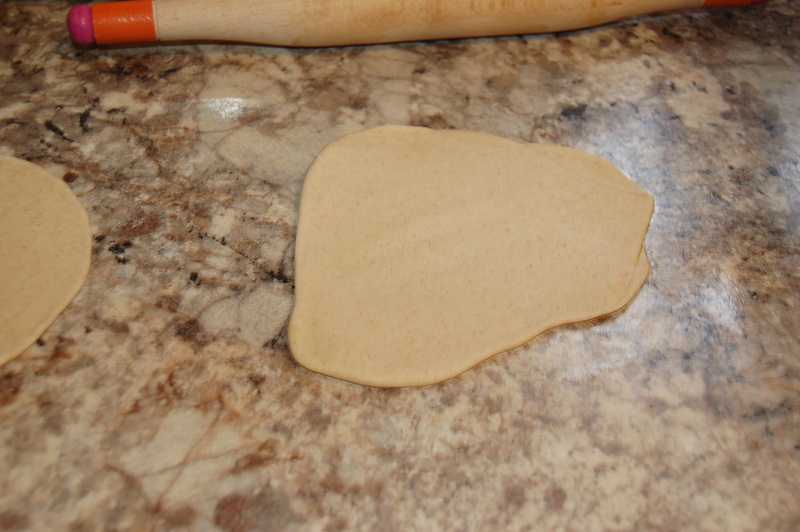 remove the dough from the bowl and stretch it into a log shape. Cut it in half, then cut each half in two pieces. You now have four pieces. Cut each of the four pieces into thirds. This is math people. I’m all about the fractions! 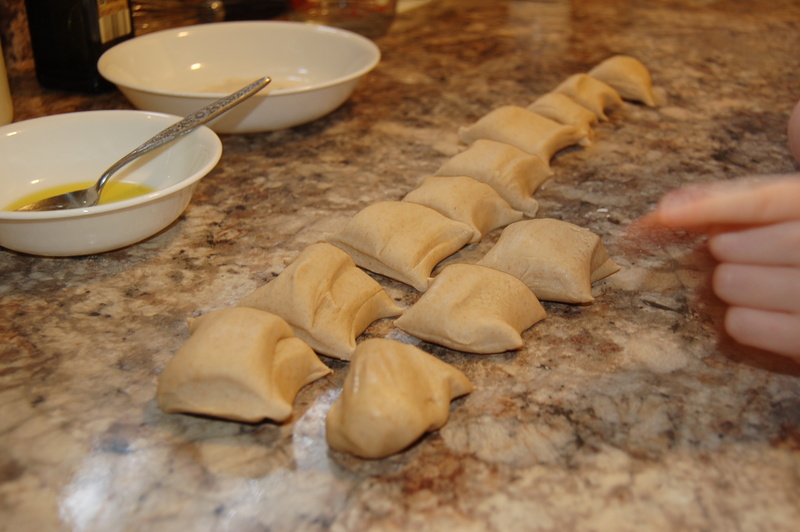 Roll each cut piece of dough in a ball and toss back into the bowl and cover again. I like bowl covers with an elastic band. It makes it easier to keep the dough from drying out, but allowing easy access. Wrestling with plastic wrap is not one of my favorite things. 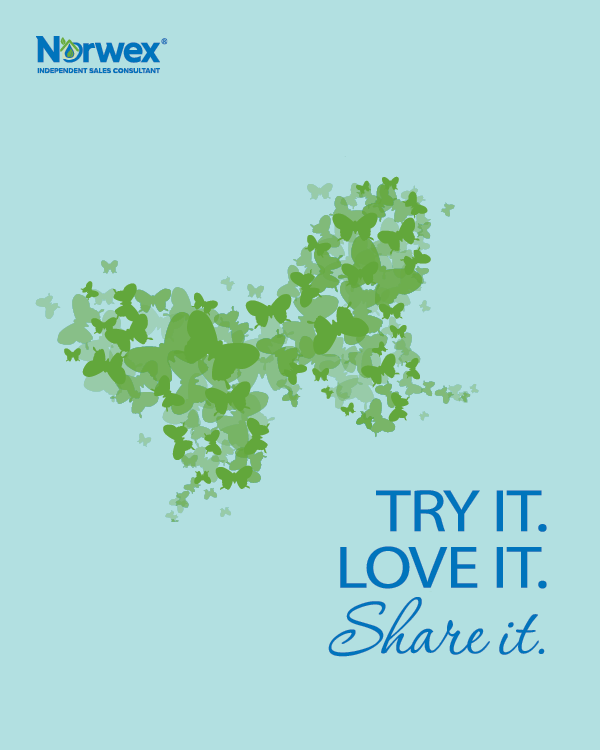 Place a cast iron comal, griddle or skillet on the stove top over medium to medium-low heat and lightly oil. Let it heat up while rolling the dough. In a small bowl, add 2 Tbsp. of oil. 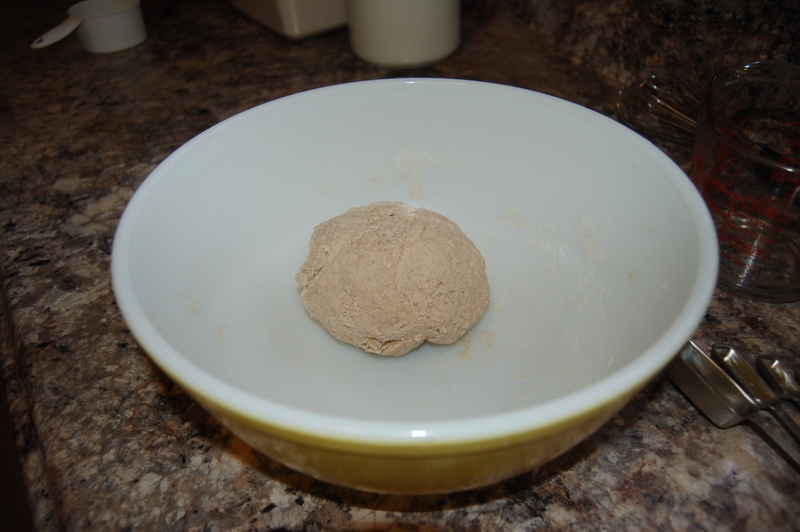 In another bowl, a bit larger and flatter, add some flour. 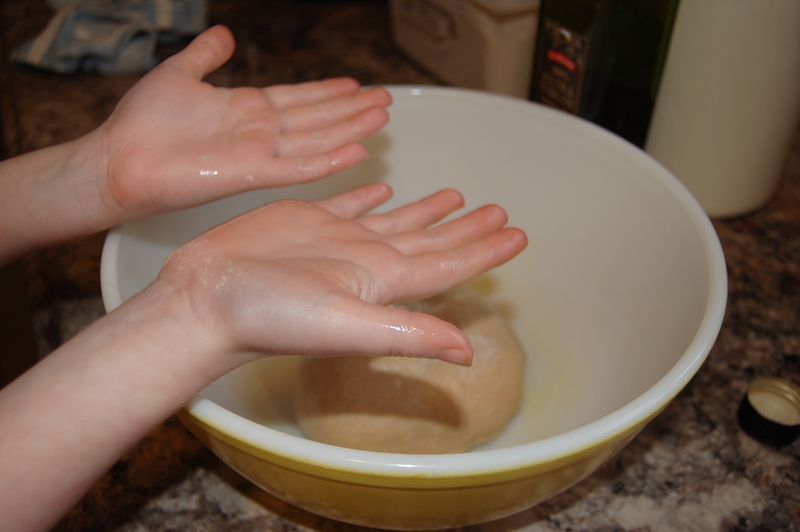 Take a ball of dough and flatten with your palms. 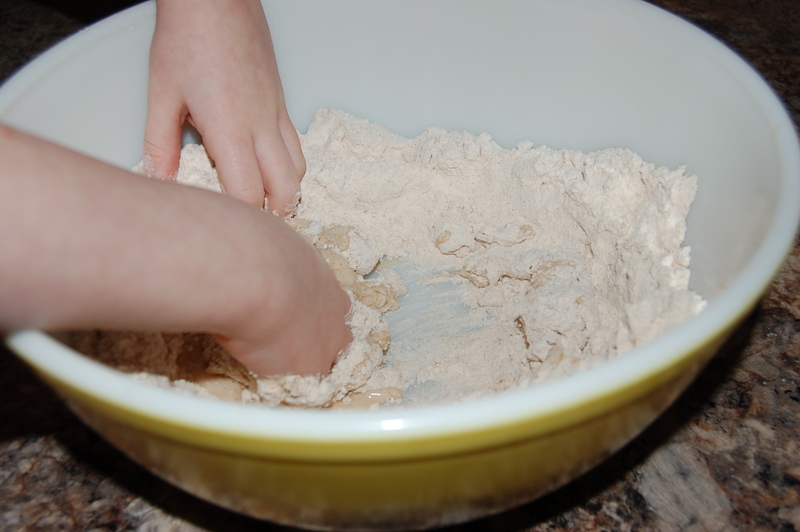 Dip into the bowl with the flour and shake off excess. Place onto the countertop and roll into a circle. 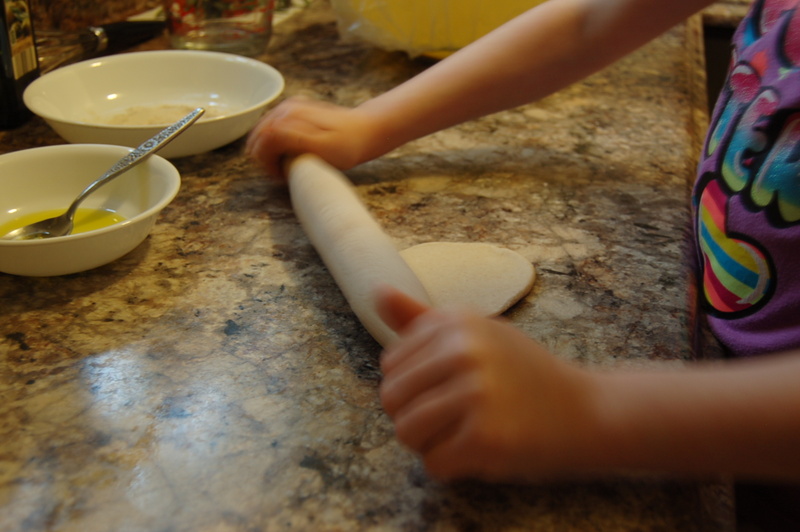 In our case, with a five year-old handling the rolling pin, it was more of a circleish. A trapezoid even. Watch out folks! We’re moving along to geometry! When you have your circle, take a small spoon with a little oil and place it in the center. Use the back of the spoon to spread the oil almost to the edges. Fold the circle in half, and then fold again. Now you should have a dough triangle. Roll out the dough to flatten. 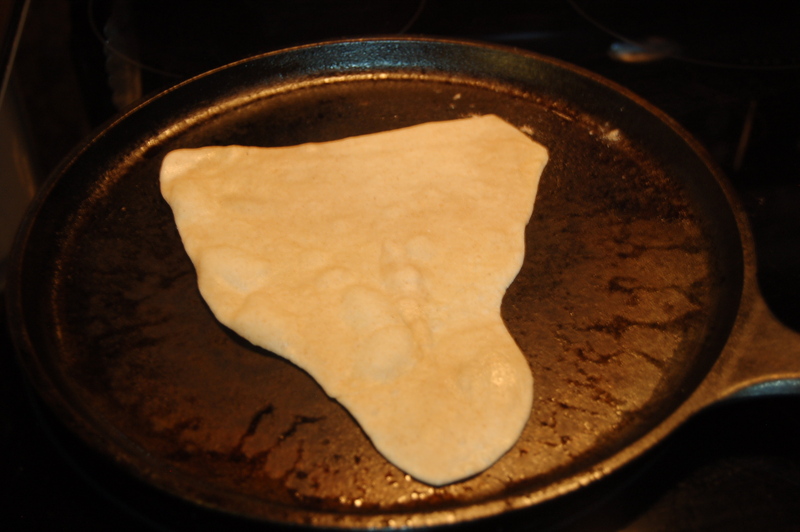 We tried for another circleish shape, but ended up with bread that looked like Africa and perhaps Australia. Geography lesson time! Place rolled dough on the hot griddle and cook for 20-30 seconds. It will begin to bubble. Watch this first one carefully so you can adjust your heat. If it browns too quickly, it will not puff up as much. We want fluffy flatbread. Flip the bread to the other side and, using a spatula or the bottom of a glass (or, in my case, the lid of my little salt cellar) press lightly around the edges. (There is this handy chipati fluffer available to match the chipati pin if matching sets are your thing.) This forces the air into the middle of the bread, allowing it to puff. Remove from heat after the second side is cooked and place on a towel-lined plate. Cover with the towel to keep warm while rolling and cooking the others. Baby Honeybee chose to eat her chapati stuffed with cheese. 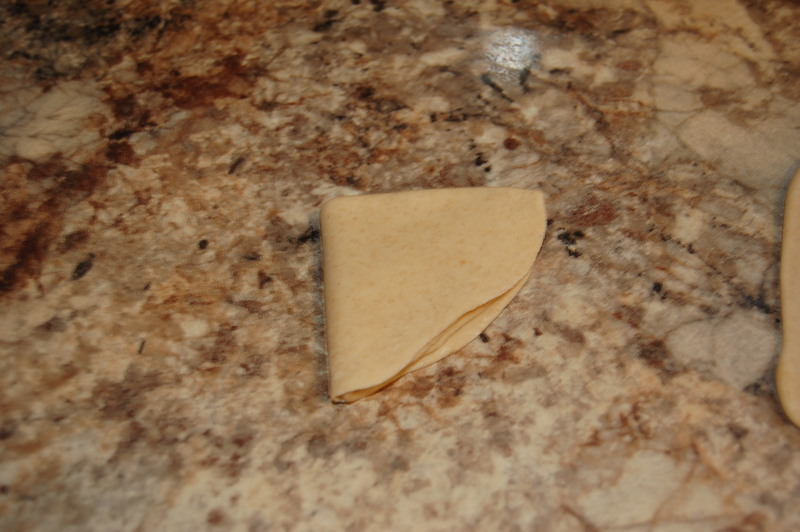 When cut open, the chapati forms a flat, pita-like pocket. If these had been gluten-free, I would have drizzled them with honey and eaten them sopapilla style. A little sprinkle of cinnamon and sugar would be delicious, too! Or, they can be filled with whatever bean, meat, cheese, rice, veggie combo you like and eaten like a soft taco. The world is your oyster! Or, chipati! Fill it with goodness! That sentiment needs to be on a T-shirt or something. A bumper sticker at the very least. This post is linked up with Strangers and Pilgrims on Earth Art of Home Making Mondays. Hop on over to see other great posts! I enjoyed your site today. The bread that you were making reminded me of my love for the Indian Culture. I would like to suggest to you a great field trip for your children. Every summer, Ft. Stanton has Ft. Stanton days. Ft Stanton, NM is north of Ruidoso on the way to Capitan. Really not very far from Ruidoso. We love to go there during the “days”. The parade grouds are set up with demonstrations, Indian dancing, weavers, artists, food and games played by children during the old Ft Stanton days. You would enjoy it as much as your kiddo’s would. Only during these days do they give tours that go back into the property away from the Ft. Those tours are done by authors who have writeen about the history of Ft. Stanton. This tour is a must as his oratory is fantastic. The cemetery there is so interesting. There are civilians buried there from Germany….now that’s a real interesting story in it’s self how the German civilians ended up at Ft. Stanton. Hi Gertie! Thank you for stopping by and for the tip about Fort Stanton. We drove out to Alamogordo a few years ago and it was beautiful! It sounds like something we would enjoy. I was fortunate enough to have experienced Pow Wows when I was younger and would love my kids to have that same opportunity. 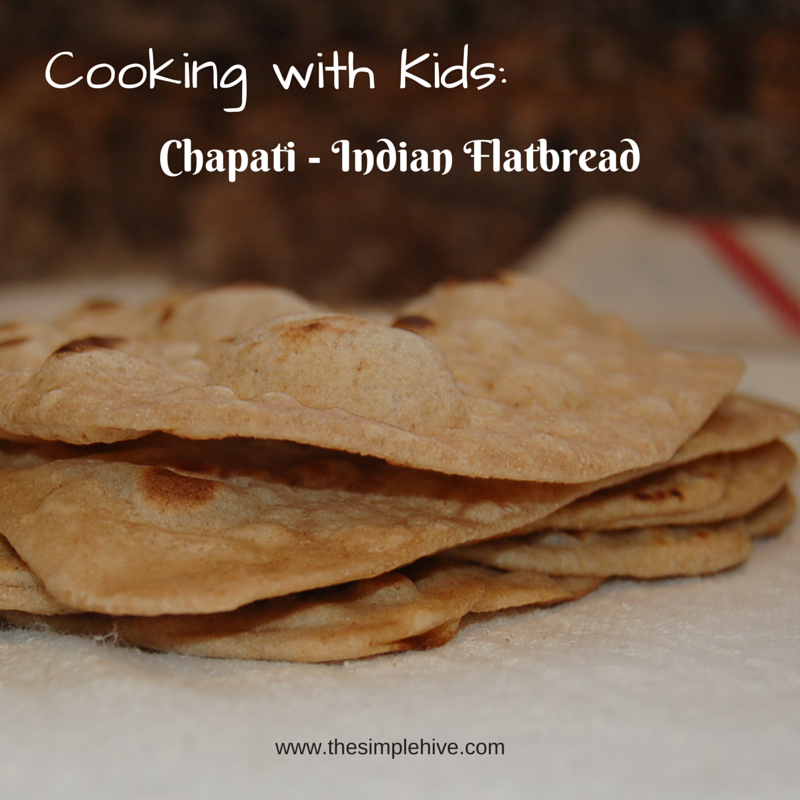 Although chipati is a recipe from India, it makes me miss the fry bread of my youth! I don’t fry foods often, so when we make fry bread, it’s a treat. Too bad I haven’t come across a good gluten-free fry bread recipe. Maybe I’ll have to experiment with some flours! Thanks again! How many chapatis does this recipe make?